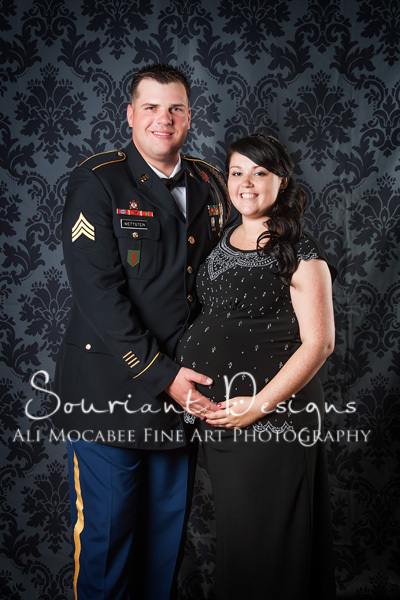 These three couples from one of my recent military balls are all expecting a new little bundle of love. Please help one lucky couple WIN a complimentary artistic newborn session, complete with a stack of 4x6 prints from Souriant Designs. All you have to do is leave some LOVE under the picture. Your comment (one per person) equals a vote! Contest ends on August 25th and we will tally up the votes and award the winner. If you are local and you would like to stay up to date on future promotions, specials, and what's new with Souriant Designs, please "Like" us on Facebook! So cute! This one has my vote! I vote for them! SO cute! Too cute not to win! love this pic! love u casey!! great picture! hope you win. I wish I'd had good pictures done of my girls as newborns. I hope you guys win! Great pic, hope you win! Awwww you two look so adorable and Lauren especially with her baby bump. You guys look great! Baby Easton will look so cute in his new pictures! Good luck, you got my vote! Love! Love! Love! Them and baby Easton !!!! That's my nephew in there!!!!! They've got my vote! She's simply glowing and he looks truly thrilled!! grew up with James and I'm so happy for his wonderful bride and beautiful family! Always nice to see friends go on to a great life! Great couple. They deserve this!!! Cute couple! They've got my vote! Easton is so cute he would be an awesome subject to photograph!!!!! For me it's you guys!!!! A vote for my favorite couple!!!!! We can do this !!!! Do it for baby Easton !!!! I love you guys, ur great!!!! Baby is so cute he needs to photographed!!!! Baby photos are the best! You will have to make your kids show them to you over and over again when you are old (that's our plan, haha)! Go go go you can do it!!!!!! Go guys I hope you win!! Her bump is so cute!!!!!! Come lets get this couple some pictures!!!! Great couple they deserve it!!!! Let's get some pictures for you guys!!!! Come lets get this for them!!!! My nephew is too cute not to win!!!!! My granddaughter is radiant !!!!! We can do this for them. They deserve it!!!! My vote is for u guys!!!! My vote is for my cousin!!!! Let's do this for you guys, you deserve it!!!!!!!! I'm with my husband, you get my vote!!!!! Your mom is so proud of you!!!! Voting for my friends daughter!!! My sister and her husband should win!!! My vote is for you guys. Woot woot here is my vote! The first couple is trying too hard!!!!! They deserve it! here is my vote! Absolutely beautiful! here is my vote! My vote is for you!!!!! Heres for my great grand baby!!!! I vote for you guys!!!!! Absolutely stunning! you have my vote! You look beautiful Lori! and James too! :) you have my vote! I can't wait to see Easton in these pictures!!!! Great pic definitely have my vote! I like how professional James looks!!!! Love you guys here is my vote!! Great picture! you have my vote!!! Love you guys. Hope you win!!!! I vote for you guys!!! Beautiful family!!! you got my vote for sure!!! Hope you guys win! you have my vote! Go gettum. By the ways Easton is a cutie!!!!! One phone call from your mom Lauren and here is my vote. You deserve it. Here's my vote! love this picture! Love the backdrop in picture!!!! Hey cuz hope you win this one! My vote is for you guys!! cute picture! Good luck. You got my vote if it helps! You got this my dear!!!! Mija we're working hard for you!!! Right on James! hope you win! my vote! I hope you guys win. You have a beautiful little boy!!! Go guys! Love your outfit Lauren! Sweet picture. Worthy of your uniform.